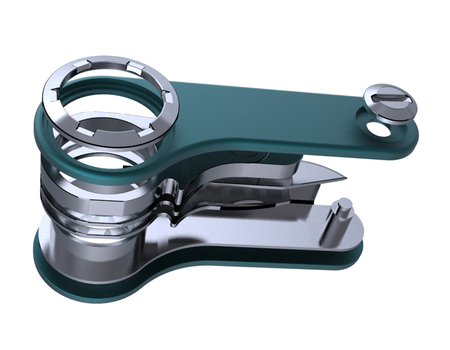 Julie at The Gadgeteer reports on a new multi-tool that you can configure yourself. The Switch set from Quirky comes in a case with two exterior body covers, two slotted axle caps (removable with a quarter), three interior axle assemblies, and 18 tool attachments. You pick the tool attachments you want and assemble them on the appropriately-sized axle: small for 2—6 tools, medium for 4—10 tools, and large for 7—13 tools, as shown below. The tool attachments include a standard Knife, pliers, scissors, a nail file, tweezers, a thin flathead screwdriver, a Phillips screwdriver, a small eyeglass Phillips screwdriver, a small eyeglass flathead screwdriver, a wood saw, a serrated blade, a corkscrew, a combination bottle opener/flathead screwdriver, a combination can opener/wire stripper, a pen, a magnifying glass, an LED flashlight, and — of course — a 1GB USB memory stick. It’s currently on “presale” for $68. What do you think? Is it worthwhile because it’s reconfigurable? I love multitools, but I’m not in love with this concept. It doesn’t look user friendly or comfortable to hold. I like my sog multi-tools for this reason. You can buy just about any attachment you want for around $6 and make your own custom mix, or easily replace broken parts. I agree that it looks terribly bulky and misshapen with every attachment on there, and it seems like more of these attachments could be combined (along the lines of that bottle opener/flathead). I have also found that i have everything i ever needed on my Leatherman Wave, and never felt like i wanted to remove anything. I carry a 1st generation SwissTool and I love it. This is a neat concept but it looks unbelievably bulky and unergonomic. Are you glad to see me or is that a DIY multi-tool in your pocket? So basically this is a configurable — and super-bulky — version of a Leatherman Micra (or really, any other multi-tool that has interchangeable tools), and four times the price it should be. Pliers are right on there. I like the reconfigurability of the tool, although I dislike the bulky axle. Viewing the photos at the website shows more detail. Hmm. A funky-shaped Swiss Army knife-style tool that you configure yourself. If it was actually shaped like a SAK, it might find a market. I’m with techieman33 on this one. My SOG multitool has everything I need – because I put it there. Not to mention it’s put together with common fasteners. My old Leatherman Wave, on the other hand, had a pair of five-pointed secure (hole-in-the-middle) torx bits holding it together, and a manual that expressly told me not to even think about taking it apart. Seriously, Leatherman? You expect the sort of person who carries a multitool not to want to take it apart to clean or improve it? The only major advantage it had over my SOG was the external one-handed blades, but they were right-handed, and can’t be reversed, so they always annoyed me.